It’s been no secret that screening methods to detect prostate cancer have been woefully lacking and largely inconsistent with respect to the results they provide. Yet, with the rise in validated biomarkers and advanced diagnostics coupled with next-generation sequencing methods, new liquid biopsy assays are guiding physician treatment options. Now, a group of investigators at The Institute of Cancer Research, London, and The Royal Marsden NHS Foundation Trust have developed a three-in-one blood test that could transform the treatment of advanced prostate cancer through the use of precision drugs designed to target mutations in the BRCA genes. The research team was able to isolate cancer DNA in a patient’s bloodstream and determine which men with advanced prostate cancer were likely to benefit from treatment with a new class of drugs called poly(ADP-ribose) polymerase (PARP) inhibitors—specifically the drug olaparib. Moreover, the scientists were able to use the test to analyze DNA in the blood after treatment had started, so people who were not responding could be identified and switched to an alternative therapy in as little as four to eight weeks. The third aspect of the new test came when the research team was able to monitor a patient's blood throughout treatment, quickly picking up signs that the cancer was evolving genetically and might be becoming resistant to the drugs. The investigators are optimistic that the new test could help to extend or save lives by targeting treatment more effectively, while also reducing the side effects of treatment and ensuring patients don't receive drugs that are unlikely to do them any good. Additionally, the new study is also the first to identify which genetic mutations prostate cancers use to resist treatment with olaparib. The test could potentially be adapted to monitor treatment with PARP inhibitors for other cancers. “Not only could the test have a major impact on the treatment of prostate cancer, but it could also be adapted to open up the possibility of precision medicine to patients with other types of cancer as well,” Dr. de Bono remarked. In the study, researchers at the ICR and The Royal Marsden collected blood samples from 49 men at The Royal Marsden with advanced prostate cancer enrolled in the TOPARP-A Phase II clinical trial of olaparib. Olaparib is good at killing cancer cells that have errors in genes that have a role in repairing damaged DNA such as BRCA1 or BRCA2. Some patients respond to the drug for years, but in other patients, the treatment either fails early, or the cancer evolves resistance. Evaluating the levels of cancer DNA circulating in the blood, the researchers found that patients who responded to the drug had a median drop in the levels of circulating DNA of 49.6% after only eight weeks of treatment, whereas cancer DNA levels rose by a median of 2.1% in patients who did not respond. Men whose blood levels of DNA had decreased at eight weeks after treatment survived an average of 17 months, compared with only 10.1 months for men whose cancer DNA levels remained high. 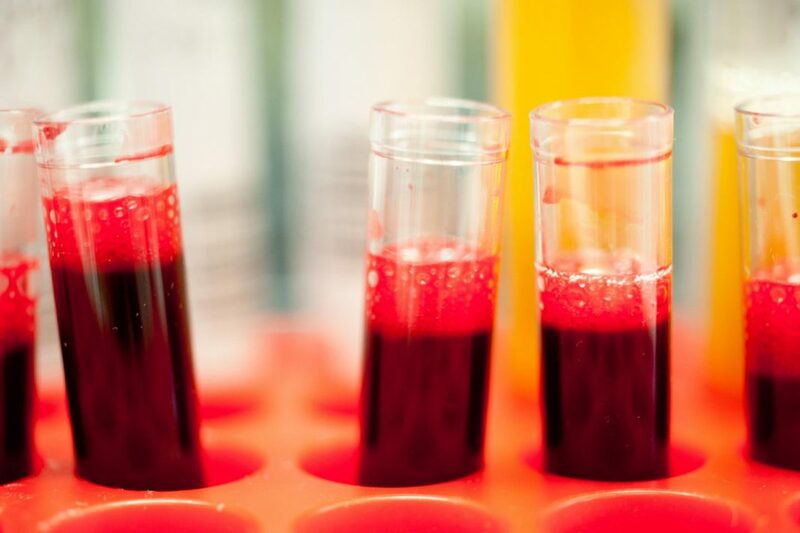 “This is another important example where liquid biopsies—a simple blood test as opposed to an invasive tissue biopsy—can be used to direct and improve the treatment of patients with cancer,” commented David Cunningham, Ph.D., director of clinical research at The Royal Marsden NHS Foundation Trust. The researchers also performed a detailed examination of the genetic changes that occurred in cancer DNA from patients who had stopped responding to olaparib. They found that cancer cells had acquired new genetic changes that canceled out the original errors in DNA repair—particularly in the genes BRCA2 and PALB2—that had made the cancer susceptible to olaparib in the first place.